Jimmy Scott was just inducted NEA Jazz Master 2007 at IAJE. 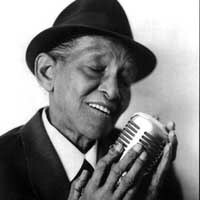 JIMMY SCOTT has Kallmann's syndrome, a genetic condition which stunted his growth at five feet and prevented him reaching puberty, leaving him with a high, undeveloped soprano voice, hence his nickname "Little" Jimmy Scott. However it was his extraordinary phrasing and romantic feeling that made him a favorite singer of fellow artists like Billie Holiday, Ray Charles, Dinah Washington, and Nancy Wilson. Scott was born in Cleveland, Ohio to Authur and Justine Stanard Scott, third in a family of ten. As a child he got his first singing experience by his mother's side at the family piano, and later, in church choir. His father was absent most of the time as he was taken with drink, gambling, and other women. Jimmy worshipped his mother, and whatever money he could make doing odd-jobs, went to her to help the family. At thirteen, he was orphaned when his mother was killed by a drunk driver. Witnesses claim she had pushed one of Jimmy's siblings out of the way of the car, but in the process of saving her child's life, she lost her own. Scott first rose to national prominence as "Little Jimmy Scott" in the Lionel Hampton Band when he sang lead on the late 1940s hit "Everybody's Somebody's Fool". Credit on the label, however, went to 'male vocalist', a slight to his talent and a blow to his career. A blow which would reoccur several years later, when his vocal on "Embraceable You" with Charlie Parker on the album, "One Night in Birdland" was credited to female vocalist, Chubby Newsome. In 1963, it looked as though Scott's luck had changed for the good. Signed to Ray Charles's Tangerine label, he recorded under the supervision of the great man himself, one of the great jazz vocal albums of all time, "Falling in Love is Wonderful". The record was yanked from the shelves in a matter of days while Jimmy was honeymooning due to a contract he had signed earlier with Herman Lubinsky. Scott's career faded by the late 1960s and he returned to his native Cleveland to work in a hospital and as an elevator operator in a hotel. He resurfaced in 1991 when he sang at the funeral of his long-time friend Doc Pomus. Afterwards Lou Reed recruited him to sing back-up on the track "Power and Glory" on his album 1992 album Magic and Loss, partially inspired by Pomus' death. Afterwards, Scott was seen on the series finale of David Lynch's show Twin Peaks, singing "Sycamore Trees." He was featured on the soundtrack of the follow-up film Fire Walk With Me. This brought him to the attention of the music industry and he has enjoyed significant success since then, singing and recording.